Of course we here at Wishpond are just as guilty of diving into the content pile as anyone, but let's put that to the side for today. Today, I'd like to celebrate some of the other fantastic social media writers and thought-leaders out there. Have any question, whatsoever, about social media? The 30 articles in this resource are sure to have the answer. In fact, they probably have the answers to questions you didn't even know you should ask. So here they are: 10 fantastic articles on social media marketing from the past 12 months (otherwise information becomes obsolete, no matter how well expressed). 10 on Facebook marketing. 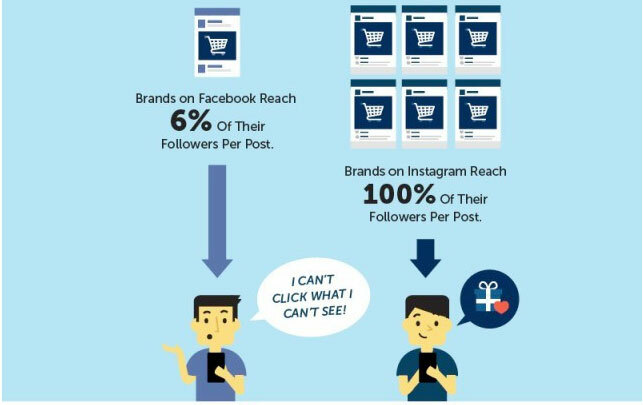 10 on Instagram marketing and 10 on Twitter marketing. Failing to align your posts with your brand might confuse your audience. Right from the text to images and videos, everything should be a reflection of your brand. Offer variety but make sure you don’t go out of context. You can cash in on major events happening across the world, but make sure it matches the core message. For instance, after the incident of Luiz Suarez (star forward for Uruguay’s soccer team) biting the shoulder of a defender on Italy’s team, an array of leading brands like Snickers, McDonald’s Trident Gum, etc. took advantage of the situation. This is perhaps the most predictable choice in this entire post: Facebook likes are important. Likes are the social currency of Facebook. Respect your fans, and don’t dilute them with fake fans. Doing so will backfire — by filling your roster with fake fans, your reach and engagement will plummet because the supply of people who will actually see and interact with your updates will be smaller. It’s also an amazing tool to create interesting and engaging statistical graphics about the global Facebook audience or your specific page’s demographic information. Facebook users are on the platform constantly (around to 20 minutes a day). Facebook Ads deliver unparalleled ability to target specific audiences. Facebook Ads cost at most about 20% as much as Google Ads per click. Facebook’s Ad platform grew 40% in Q3 of 2015, while Google’s fell 19%. With targeting options like website custom audience and conversion tracking, the platform can be made as simple or as advanced as you like. The platform is constantly updating (unlike Google Adwords), meaning it’s getting more powerful every day. Instagram is estimated to grow approximately 49% in 2016, resulting in even more potential impressions for Facebook advertisers. Think Facebook Ads might be worth looking into? This 10-chapter guide is a comprehensive walkthrough of everything you need to know about Facebook Ads, and we’ve barely scratched the surface. Two keys to any great Facebook strategy are content and consistency. It’s not enough to simply create a Facebook page. You need to show up and share valuable information on a daily basis. A solid Facebook posting strategy is one where you set realistic goals and then execute upon the tactics put in place. So, what does this look like? Review company goals and determine what you’re trying to accomplish and how Facebook marketing will move you towards those goals. Once you know what you want to achieve, now begin to segment out your daily, weekly, and monthly posting strategy. A good strategy not only eliminates a last minute rush, but also allows you to act on purpose. Audience Overlap is a Facebook Ads tool that allows you to compare up to five different audiences at once and see the percentage of people who overlap among those audiences. 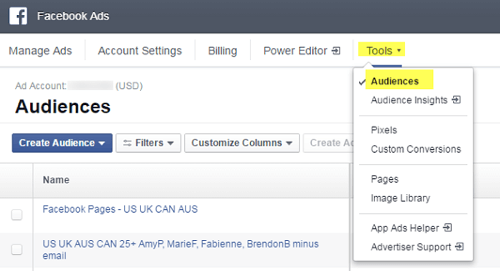 You can access Audience Overlap in the Audiences section of either the Ads Manager or Power Editor. Within the Audiences section, you can see all of the audiences you’ve created from custom audiences, lookalike audiences, or saved audiences. Are you a retailer? Are you attempting to grow a brand via Instagram? If you answered yes to either question, this guide from Wishpond will do wonders for your business. There are eight concrete tips for increasing sales through Instagram and each one is well worth your time. My favorite is the one on establishing a posting pattern. Here is why: entirely too many brands get started with Instagram marketing, just to back off when things don’t go their way. As with any social campaign, it’s good practice to stick with a regular posting schedule. This helps you to grow your brand, as readers understand that they will be presented with fresh content on a regular basis. Determine what will engage your target market by asking: What do they want to see? How can I get them to engage with my photos? What will get them talking about my company? Develop a photo curation plan around the answers. Consider using unique hashtags as keywords in order to make your company and brand easily findable. Be sure to add them to all your posts. Increase engagement levels by posting photos of you and your customer’s events, using geolocation, and adding a gamification element, like asking users to submit photos, come up with a creative captions for a photo, or solving a mystery about your photo. Calls to Action are a must for any social strategy, but they are hard on Instagram. Linking isn’t allowed in image descriptions, a harsh weapon against spamming and link building that became a huge issue on the open platform of Twitter. So you don’t have the usual avenues for CTA’s that you do on other sites, not even the link back like you have on Pinterest. That doesn’t mean you can’t have a CTA. You just have to be a bit more roundabout, and know where to direct them. At the end of your posts, ask them to follow, fav, and comment. But go a step further and tell them to check out the link in your About Me. Then put a link that directs to any page in your website that is most actionable. Maybe this is a main page, or it could be a service/product page. You can also place a CTA in your bio. Models do this all the time, asking people on their bio to follow and share them out. It is a direct approach that gets people the second they check out your profile. Social media is Generation Y’s word-of-mouth. If you have customers posting Instagram photos about your product and brand—consider these visual endorsements. Re-gram photos that your customers have tagged you in through a hashtag or @mention. It’s a great way to celebrate your most loyal customers and to show potential customers the fun ways that your products are being used post-purchase. Don’t forget to ask the user for photo permission rights—you can easily do this by leaving a comment on the user’s photo and asking them if you have their permission to re-post. 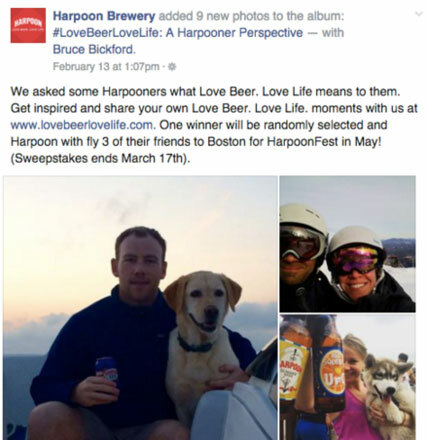 Your customers’ photos are a limitless pool of content that resonate strongly with potential customers and keep your marketing campaigns fresh. They are a marketing asset that should not be overlooked. If you really want to make an impact, you need to post to other, larger accounts in your niche, exposing your brand to a wider audience. You may already be following these accounts, if not you’ll need to find them. One of the best ways is to use [an app like] Webstagram and search for some of the closest hashtag keywords you uncovered in the beginning of this post. When you do a search for your keywords, not only will it show you the related keywords, but it also shows you the top Instagram accounts that feature those keywords. If there is an email address in the profile, it usually means they’re open to sponsored posts. There are a relatively small number of analytics tools offerings, too. Yet, there are a few that will provide the insight you need. Iconosquare (premium) tracks the number of followers and unfollowers, as well as, shows stats on your most popular photos, filters and hashtags. In addition, it goes into engagement rates that are further broken down into follower versus non-follower counts. If your Instagram handle has less than 25,000 followers, try a free report from SimplyMeasured. Just pop in your account name and get insights into average engagement rates, as well as, the best times to post, the most active followers, top locations, and other engaging information. Tip #28. Post fun, authentic videos of your CEO - Make your top executives look personable. Make short, quirky videos of them to post on Instagram. For example, get them show one thing they like to do when not working, or doing something fun at the office. Tip #29. Share exclusive content - Use your Instagram feed to show photos you haven’t shared on your Facebook, Twitter or blog (and vice versa). This makes your followers feel special. Tip #30. Launch a product live on Instagram - If you’re launching a new product, taking your music group on tour, or opening a new store, etc - do it live on Instagram. For example, the day you launch your product, make a few 15 second videos of you and staff behind the scenes preparing for the launch, and the actual launch with excited customers. Post this to Instagram. Once you find content you want to share, it’s time to schedule it. Many services are switching to a “queue” type of scheduling, where the next tweet at the top of your queue is sent at the times you implement. However, if you want to schedule manually, it’s easiest to do it daily during your engagement time, or all at once at the beginning or end of the week. Besides the two mentioned, you can also schedule posts on other platforms like LaterBro or TweetDeck. Currently, you can’t schedule tweets within Twitter.com itself. If your tweets need approval from a manager, consider creating a content calendar in Excel or Google Sheets that uses a set template to create new tabs each month or week. Content calendars make it easy to ensure you are promoting your own content, as well as anything else you want to cover such as events or new product launches. Twitter also has an editorial content calendar tool that lets you see key events each month in certain countries and how you can schedule around them in order to gain visibility for your company. While this may seem like a small point, did you know you can tag up to 10 people in a Tweet image? Used strategically this means you can actually tag 10 additional accounts that would have affected your character limit in the original Tweet. If you’ve produced a piece of content with input or examples from multiple people, this is a great way of alerting them to your post and boosts your chances of extra engagement. Alternatively, it could be used to tag relevant celebrities, competition winners, or other profiles under your brand umbrella. Twitter Cards- set up your blog posts so that the appropriate meta tags communicate your article's details to Twitter. Once set up and approved, any tweets of your content will automatically include link previews like on other networks. Pinned Tweet - Twitter will allow you to permanently display any of your tweets at the top of your timeline, making it the first tweet a new follower sees if they look at your profile. You can pin a new tweet any time you wish by going to your profile, click the ... button in the lower left of a tweet to reveal more options, and select "Pin to your profile page." While you can pin any of your tweets, what's particularly effective is if you pin one of your best articles that contains a digital download for lead generation. This is one of the most underutilized Twitter marketing tactics. And people who do try to use it often jump into the wrong conversations! A few Twitter search tricks will help you find the topics that are most interesting to your followers & customers -- then you can become part of those conversations by adding value to the discussions. Here’s a story that happened to me last year. Don Power tweeted about coffee, and little did he know that I was looking for tweets about that very topic. I professed my love for coffee & asked Don if he'd ever had java from Malaysia... my home country. And then I sent him a bag! Don & I have chatted ever since. Don even told this story when he spoke at a conference. And I get new followers on Twitter all the time... thanks to Don! While most social media experts will tell you to try and engage with influencers so you’ll get more credibility and followers, it’s quite hard to do. Influencers are extremely busy most of the time and are probably responding to tens if not hundreds of mentions on Twitter daily. They will usually have their own content to promote and their own very clear agenda to follow. Content creators are the ones people seek their attention. Content curators and just-beginning content creators are usually the attention seekers. If you’re just starting out and want to build your following, start by attracting the content curators, they are the ones who will actually share your content and be the foundation of your increasing reader-base. Almost everything we posted went out to Facebook, LinkedIn, Google+, and Twitter (only select posts went to the discovery channels) but none of the channels really took off except for Twitter. We kept nurturing Twitter because it “just worked” without needing us to engage much more than just posting the content. 13. Use keywords in your tweets. People search for all kinds of tweets and Twitter users everyday. How are they supposed to find you if you don’t use related keywords in your tweets? 14. Use more images and videos for more Twitter feed real estate. The more space your tweets take up in people’s feeds, the more noticeable they will be and the more engagement they could get. Don’t use nothing but images and videos though. 15. Mention others and use direct messages to establish better relationships with influencers. If you have some followers that share your tweets a lot, recently interviewed an influencer, linked to someone in a blog post, etc., give them a shout out and thank them for what they do. 16. Actually reply to mentions and retweet cool stuff from your followers. Don’t be too robotic on Twitter, even if it is tempting with all the cool tools out there. If you want your contagious article to take off, you have to make a few influential people tweet it to their huge audiences. use their products and share your experience. I have had people ask me what exactly my Twitter strategy is and what I am actually doing every day on Twitter. So I thought I would write up a post showing you exactly what I do. Feel free to copy my strategy step by step! And the great thing is every tool I am using is completely free. Twitter is currently my favorite social network. It drives more traffic to my site than all the other social networks combined and I have made a ton of new connections on Twitter. I have gotten interviews via Twitter, guest blogs post, you name it. Hopefully these 30 awesome social media marketing articles have inspired your own social media strategy. Each platform has its strengths and its weaknesses. Don't count any out, but equally don't dive head first into social without being sure you can track your successes. Looking for help with building up your social media Following, or get leads and sales from a specific platform? Wishpond can help.